⬅ What Is a Mummy Makeover? If you desire a ﬁrmer, more youthful-looking body contour, then a surgical body lift may help achieve your goals. It improves the shape and tone of the underlying tissue that supports fat and skin. In addition, the procedure(s) can improve a dimpled, irregular skin surface, commonly known as cellulite. Lower body lift: The lower body lift is the most common type of body lift in my practice. It typically includes a tummy tuck (abdominoplasty), thigh lift, and buttocks lift performed at the same time. The incision is concealed around the hipline so that it’s not visible when wearing underwear or a bikini. Upper body lift: For patients with severe skin laxity of the upper torso, an upper body lift may be the appropriate treatment. This typically includes a bra line back lift and upper abdominoplasty. The procedure is individualised for the particular patient. Candidates for body lifts typically have lost large amounts of weight. They should be healthy and well-nourished without vitamin or mineral deﬁciencies. They should not smoke, as smoking increases the risk of complications. Body lift is performed under general anaesthesia, with the patient positioned on their stomach, and the surgeon removes a large, belt-like segment of skin above the buttocks, up to the lower back. When the wound is closed, the thighs and buttocks are lifted. The patient is turned over and the surgeon continues to work on the front of the thighs and abdomen. Indeed, when a surgeon performs a circumferential removal of skin and fat of the lower abdomen, and when combined with undermining of the thighs, it will lead to a lift of the buttocks and thighs. A body lift can be done in two stages, with a three-month gap between procedures, or as a single stage surgery. Patients usually take at least two weeks oﬀ from work following a body lift. I encourage patients to ambulate shortly after surgery. They may resume full exercise approximately 6 weeks following surgery. The results of a body lift are visible almost immediately. However, it may take as much as one to two years, or more, for the ﬁnal results of the body lift procedures to fully develop. Since weight loss patients have poor skin elasticity, the closure must be as tight as possible. However, over-resection of the skin followed by overly tight closure of the tissues can lead to wound rupture or to broadly depressed scars resulting from suture pull through, breakage or premature dissolution. At the same time, insuﬃcient removal of skin and low-tension closure leaves sagging tissues, skin rolls and/or wrinkles. A body lift should be seen as a critical step in overcoming obesity, with the potential of ceasing or reducing medications used for diabetes and high blood pressure. Patients need to take steps following surgery to maintain a healthy lifestyle, ensuring that their new shape will be long term. 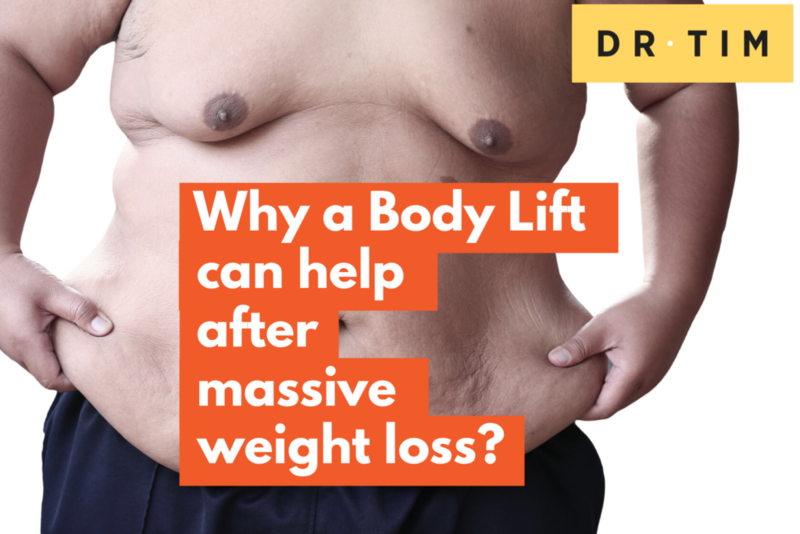 Question: Do you feel that a body lift can improve self-esteem following massive weight loss? You can leave a comment below.